Drew has a difficult time at school. She's being bullied and there's always a terrible threat looming over her, while the last thing she wants is being the center of attention in a negative way. Drew's brother Mason is acting out because of the disappearance of their father. He's expelled from school and this lands him in a residential reform academy. When Drew receives an alarming message from one of his doctors she tries to make their mother see sense and reports it to the police, but when nobody is making any effort to get her brother out she only sees one solution, she has to go in herself. Drew has an escape plan, but will it work and will she be able to rescue her brother or has she made the ultimate sacrifice in vain? The Treatment is a fantastic story that kept me on the edge of my seat from beginning to end. Drew is brave, she can stand up for herself, she's resourceful and she's smart. I loved her personality. She knows who she can trust and who she should stay away from. When she finds out what is being done to the students of the reform school she doesn't hesitate and will do anything to rescue her brother, even when that means facing her worst fears. She's a true heroine with an admirable personality and I loved reading about her adventures. C.L. Taylor has an amazing gripping writing style. The Treatment is so nerve wracking that I forgot about the time, didn't notice what happened around me and kept having to remind myself to stop holding my breath. I really loved this terrific story set in the near future. The reform school is fabulously creepy and finding out more about the procedures that are being used made me fly through the pages. I loved the world building in combination with the psychological experiments, everything is exactly right and connects in a brilliant way. 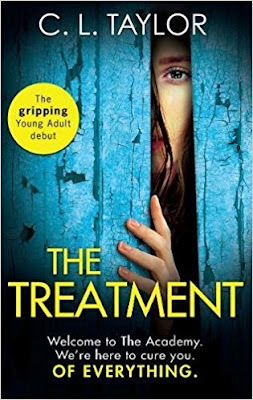 The Treatment is a great thought-provoking must-read with plenty of surprising twists and turns and a mesmerizing ending. If you love gripping YA you should definitely read The Treatment. This one sounds SO good! I can't wait to give it a read! So excited about this book, can't wait to read! I know how Drew feels, I would do anything for my sister and brother as well. Siblings relationships themed novels are making a huge come back on shelves, great! Oh boy. I do love a story that keeps me on edge and not wanting to put it down. Love this plot too! Oh, my. Yes, I do. Thanks for this wonderful review. Yikes, this sounds creepy & scary and definitely un-put-down-able! Drew sounds like an amazing character. It sounds like one of those stories that makes your heart pound. It sounds like a really gripping read. Thanks for sharing it.